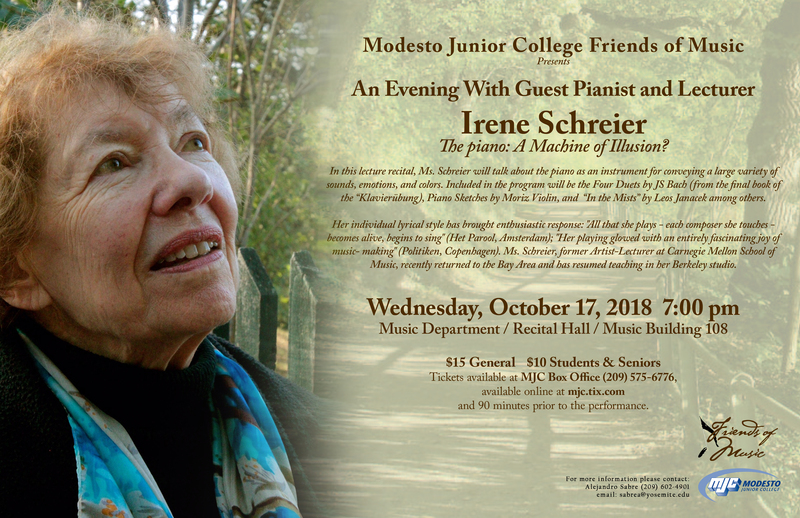 The Modesto Junior College Friends of Music series presents An Evening with Irene Schreier on Wednesday, October 17 at 7 p.m. in the MJC Music Recital Hall on East Campus, 435 College Avenue, Modesto. “The Piano: A Machine of Illusion” is the topic of Schreier’s lecture recital. She will discuss the piano as an instrument for conveying a variety of sounds, emotions and colors. Included in the program are “Four Duets” by J.S. Bach, “Piano Sketches” by Moriz Violin and “In the Mists” by Leos Janacek, among other works. Schreier, a former artist-lecturer at the Carnegie Mellon School of Music, recently returned to the Bay Area where she has resumed teaching in her Berkeley studio. She has performed and lectured across the U.S. and in Europe. Tickets for An Evening with Irene Schreier are $15 general admission and $10 for students and seniors (62 and better). Tickets are available at the MJC Auditorium Box Office, open Tuesday through Friday, from 12 noon to 5 p.m. or by calling 575-6776 during Box Office hours, and are available online at www.mjc.tix.com. Tickets will also be available at the door beginning 90 minutes prior to the performance in the Music Recital Hall.